At 70" The SHARP PN-70SC5 FULL HD BIG PAD is a good choice for schools looking to upgrade Interactive Whiteboards with a minimal reduction in their screen size. A simple swap over solution that will connect to your existing IT equipment with little disruption to teaching staff. The SHARP inking software is extremely user friendly with easy to follow icons that make using the display effortless. The impressive handwriting recognition will convert your onscreen writing into standard text for instantly sharing notes from lessons or meetings. Includes ''Optical Bonding'' as standard for eye catching image brilliance and a more immediate touch response. A high quality professional Interactive Display with a 5 year onsite SHARP education warranty that GPS can include free of charge. The PN-70SC5 is suitable for both education and business users and fully compatible with your existing PC and software packages. SHARP Display Connect allows a quick and easy way to share your on-screen content to up to 50 users, connected via Smartphone, Tablet or PC, as well as being able to grant control to any of the connected users, perfect for the education and business environment and works flawlessly. The Sharp BIG PAD PN-70SC5 is the ideal model for higher education campuses and corporate office applications. Offering state-of-the-art collaboration with outstanding price performance, Sharp’s next generation 70” BIG PAD is optimized for the campus and SME environment to enhance communication and create the best conditions for effective collaboration. Whether in a classroom or a meeting room, it can sometimes be a challenge to keep everyone focused and engaged. That's where Sharp's innovative BIG PAD PN-70SC5 comes in. The generous Full HD 70" touchscreen monitor lets you display, create and collaborate with ease and precision. The acclaimed, smart and intuitive SHARP Pen Software opens up new ways for brainstorming, sharing ideas and finalizing decisions. Powerful, flexible and surprisingly cost-effective, the latest Sharp BIG PAD PN-70SC5 provides an outstanding platform to either boost collaboration, enhance audience impact, or simply increase meeting effectiveness in the corporate office or campus environment. 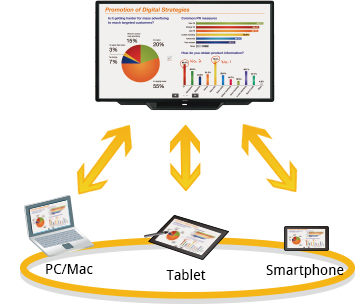 SHARP Display Connect software supports effective and multifaceted communication. By enabling connection with mobile devices, SHARP Display Connect facilitates interactive presentations, lively discussions, and paperless meetings in both business and educational settings. Files can be transferred between mobile devices even if they are not connected to the PN-70SC5. Users can capture onscreen images and save them on their mobile devices to make personally annotated memos. SHARP Display Connect also connects two BIG PAD on the same network (intranet, VPN, etc.) to enable larger-scale interactive communications.